This slogan is splashed on a billboard that welcomes people to the town of Williston, North Dakota. Mayor Howard Klug repeats this message often. "We have come a long way since we were a tent city," he says, referring to the days when people camped out in the Wal-Mart parking lot. But Williston is still a living contradiction. There's not enough housing—or jobs—for every fortune-seeker making his way here with a backpack and a few dollars in his pockets (yes, they are mostly men). But not too long ago, the local Wal-Mart was paying $17 an hour and rumors abounded about roughnecks making six figures to work the nearby oil fields. "Things have changed in the last six months," says Kristin Oxendahl, community engagement director for the Salvation Army of Williston. "Our economy hasn't crashed, but we don't have quite the boom we had several years ago." Last year, the Salvation Army paid for 179 bus tickets to help people get back home. Some lost their jobs after the oil boom fizzled. Others showed up and were dejected to find no more high-paying work. Fracking technology, which allows oil companies to remove crude oil buried under once-impenetrable rocks, has turned North Dakota towns like Williston into overnight boomtowns. Though oil prices have lagged and job growth has slowed in recent months, Williston remains the fastest-growing small city in the nation, according to the latest Census figures. But the city is struggling to keep up with the explosive growth. The sewer system needs an overhaul. The schools need more teachers and classrooms. And rents here are among the highest in the nation (about $2,000 a month for a one-bedroom apartment). Dozens of people stop by the Salvation Army downtown each day for free lunch. Some of them sleep in their cars because they can't afford a place to live. These newcomers often have clashed with longtime residents of this prairie town. Oxendahl, who was born and raised in Williston, remembers the days when she recognized most people in the grocery store. Or when people didn't lock the doors to their homes and cars. That's not the case any more. "Now it's different and it scares a lot of people," Oxendahl says. "But in a lot of ways, Williston is just catching up with the rest of the country." People from all over the world have started moving here. The predominantly white town has started seeing its first African, Asian and Latino families. 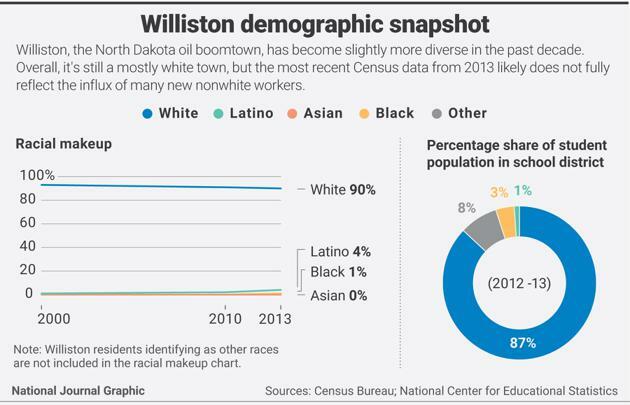 The rate of blacks and Latinos nearly doubled in Williston to 4.8 percent from 2010 to 2013, according to Census data. When Viola LaFontaine took the helm of the Williston Public School District six years ago, there was only one student who spoke English as a second language. Now there are more than 100. The most commonly spoken foreign language is Spanish, she says, followed by Turkish, Russian and French. There are also many students from outside the state, resulting in a student population increase and a teacher shortage. Though the school system added 25 instructors in the past six years, it still needs more math and English teachers. The district even had to reopen an elementary school that it shut down years ago. "It's a very transient population, so you never know how long a student will be here," says LaFontaine. Finding housing for teachers also has been a struggle. So the school district purchased a pair of fourplex apartment buildings for some of them. They give teachers a housing allowance because it's hard enough to live here on a $40,000 salary. Many teachers have to work part-time jobs. Money is now the main thing on Mayor Klug's mind. Specifically, getting more oil profits flowing into town coffers. Local governments get 30 percent of oil tax revenue. One of his first priorities is replacing Williston's sewer system. "We're still taking on massive debt problems because our sewer is only designed to handle 15,000 people," says Klug, a longtime Williston business owner. A new sewer system will cost the town $110 million and is the only thing that will prevent the town from dumping raw sewage into the Missouri River. Another thing on Klug's mind is the airport, which he says needs a major upgrade. It was designed to handle about 10,000 passengers a year. Last month alone, 12,000 passengers came through. Klug, who was elected in 2014, promised to make sure that Williston prospered from the oil boom while still retaining its "old-time values." "A lot of people were angry because their friends moved away and they weren't able to get a table at their local restaurant," says Klug. "We're not the same town, but we're better now. We had 15 new restaurants open this year." He says that Williston is still a town of opportunity for people looking to strike it rich. He says all you need is common sense, a few skills, hard work and being able to budget your money.